This evening session provides a quick end-to-end guide to creating a social media network map with content analysis using free and open tools. Dr. Smith will demonstrate how text from social media can be clustered by applying social network techniques. An entertaining review of social science concepts and tools will provide the context for understanding social media in terms of networks. If you can make a pie chart, new tools like the free and open NodeXL (http://nodexl.codeplex.com) make it almost as easy to make a network chart. If you would like deeper understanding of the social media landscape around your business and brands, this workshop is for you. Marc Smith, Ph.D., is a sociologist specializing in the social organization of online communities and computer mediated interaction. Smith leads the Connected Action consulting group (http://www.connectedaction.net) and lives and works in Silicon Valley, California. Smith is the co-editor with Peter Kollock of Communities in Cyberspace (Routledge), a collection of essays exploring the ways identity; interaction and social order develop in online groups. Along with Derek Hansen and Ben Shneiderman, he is the co-author and editor of Analyzing Social Media Networks with NodeXL: Insights from a connected world, from Morgan-Kaufmann which is a guide to mapping connections created through computer-mediated interactions. 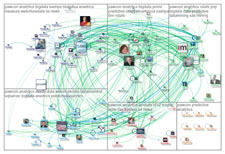 The Connected Action consulting group applies social science methods in general and social network analysis techniques in particular to enterprise and internet social media usage. Smith received a B.S. in International Area Studies from Drexel University in Philadelphia in 1988, an M.Phil. in social theory from Cambridge University in 1990, and a Ph.D. in Sociology from UCLA in 2001. He is an adjunct lecturer at the College of Information Studies at the University of Maryland. Smith is also a Distinguished Visiting Scholar at the Media-X Program at Stanford University.